Sometimes people driving cars turn left across the path of a motorcyclist. In a perfect world, there would always be time for the motorcyclist to stop or swerve around that car without a collision, but it is not a perfect world. If a collision does occur, does the fact that a person turned left in front of that motorcyclist mean that he caused the accident? Not necessarily. He CAUSED the accident only if the motorcyclist HAD TO do something to avoid it, AND IT WAS IMPOSSIBLE FOR HIM TO DO SO. If the motorcyclist could have avoided the accident, then the driver and the rider BOTH contributed to the cause of the accident and their contributed percent of negligence determines just how 'at fault' the driver was. This is a case where an elderly man, driving his car on a three lane surface street, one lane in each direction with the center lane used for turning across the opposing lane, moved into that center lane in preparation for a left turn into a shopping area parking lot, then turned left and was struck by a motorcycle that was approaching in the opposite direction. Already the odds are that you have decided that the person driving the left turning car was negligent and responsible for the collision. I will show you that jumping to such a conclusion is inappropriate and can cause unbelievable damage and injustice. The car (green) was traveling east bound (from left to right) on the street while the motorcycle (red) was traveling west bound (right to left). When the car turned left into the driveway the rider of the motorcycle aggressively applied her rear brake (there is no indication that she used any front brake at all) and immediately began a skid with the rear-end of her bike yawing counterclockwise as it left a 43.5 foot skid mark. At the end of that skid mark the rider released her rear brake and as a result of that the bike high-sided. The bike flew about 11 feet before it landed on its right side and then, without flipping over or into the air again, scraped along the roadway for an additional 27.5 feet before coming to rest. As a result of the high-side, the rider was launched into the air and flew for about 27 feet before colliding into the right side of the car. That collision resulted in breaking the back of the rider and the severing of her spine which caused a permanent and complete paralysis below her waist. The bike did not collide with the car as it slid on the ground and passed just behind it. The driver of the car claims not to remember seeing the motorcycle but argues that it must have been traveling at least 50 mph in the 30 mph zone she was riding in because of the length of her skid mark, the fact that he was certain it was safe to make the left turn, and that he did not even rush the left turn he made into the parking lot. The rider claims that when she noticed the car turning to the left she had no time to do anything else other than brake and that despite what the car driver claims, she was not going faster than 30 mph at the time. There were no other witnesses to the event. An accident reconstructionist claims that the motorcycle was traveling at from 28 to 31 mph when she began her skid. Let's look at how such a conclusion could be made from the evidence we have so far to see if we can find agreement with it or to find areas with which we disagree. In order to determine a speed at any point along the bike's path of travel, we must start with a KNOWN (or derived) speed at any other point in its path. Since the bike did not impact the vehicle, we cannot use a typical crush analysis to obtain an estimated speed of impact. (The amount of damage done to the rider, however, suggests that she struck the car with considerable force which, in turn, suggests considerable speed.) What we do know, for certain, is the speed of the motorcycle at the end of its path of travel - zero mph. Since there were no gouge marks along the scrape path, and because there is absolutely no indication that the bike's left side touched the ground (no scrapes of dents of any kind), we are certain that the bike skidded on its right side while leaving the 27.5 foot scrape on the roadway following the high-side. Chrome, steel and plastic sliding on this roadway generates a coefficient of friction of somewhere between 0.3 and 0.5. To get a reasonable estimate of the speed lost during the bike's slide on its side we will assume a CofF of 0.4 and can revise our estimate, if necessary, following the complete analysis. With a CofF of 0.4, we calculate the bike's speed at the time that it began sliding on its side to be slightly more than 18 mph. Since the accident reconstructionist's report finds that the motorcycle was traveling at between 18 and 21 mph at the time of the high-side, our numbers agree, so far. 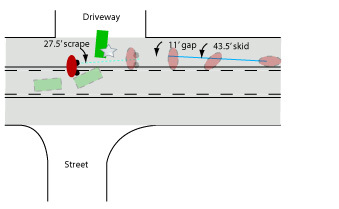 Because there is an 11 foot gap in terms of roadway markings between the end of the skid marks and the beginning of the scrape marks, we can conclusively assume that the bike flew through the air a distance of 11 feet as a result of the high-side. Since air resistance at speeds around 20 mph is insignificant, we can also conclude with very high confidence that the speed the bike was moving at the time the high-side occurred was also slightly higher than 18 mph. Similarly, we can conclude with just as high confidence that the motorcyclist impacted the car at that speed. It is simply amazing how damaging to the body such a relatively slow speed collision can be! Since the motorcycle was traveling at just over 18 mph when the high-side occurred, we can continue with our analysis and determine what its speed must have been when the skidding began. First, we need to determine the drag factor to use. The drag factor is the product of the CofF between the bike's tires and the roadway multiplied by the braking efficiency used during the stop. The CofF, though not measured, was approximately 0.8 (the roadway was cement, it was dry and had no loose sand or gravel on it, and there was no grade or slope). Given that there was a skid mark showing only one tire, and because there had been a high-side, it is extremely likely that the mark was made by the rear tire. Since a rear tire skid using only the rear brake indicates a braking efficiency of only about .4, but because an imminent collision was known as a threat by the rider, it is reasonable to conclude that the rider did use some front brake and that the overall braking efficiency was on the order of .6. This, it turns out, is the amount of braking performance expected of even a rank amateur new motorcycle rider. That is terrible performance when your life depends on it. Thus, the drag factor was approximately .48 (0.8 * 0.6). Using a drag factor of .48 and a skid mark of 43.5 feet ending at a speed of just over 18 mph, we calculate that the speed of the bike at the beginning of the skid was slightly greater than 30 mph. This is consistent with the claim of the motorcyclist. And, since our review of the physics described above is consistent with the reconstructionist's conclusion that the bike was traveling at from 29 to 31 mph when the skid marks began, we have no basis for challenging that reconstructionist's methods or calculations. So, does that mean the left turning car driver caused this accident? Well, in almost every state in the country there is a legal definition called contributory negligence (actually, most states have revised this tort rule and now call it COMPARATIVE negligence which is somewhat more fair to all parties involved) by which the parties to a suit can try to ascertain to what extent each of them contributed to the accident. So, for example, if the plaintiff is asking the court to award it $1,000,000 in damages (the present value that those damages have or will cost the plaintiff) , but the plaintiff is found to have contributed, say, 40% of the negligence resulting in the accident, then the plaintiff is awarded about 60% of the value of the damages sought, or $600,000. How much negligence did this rider (the plaintiff) contribute to the cause of this accident? Even if the motorcycle had been traveling at 31 mph when braking began, it was entirely reasonable to presume that it could have come to a complete stop, without losing control, and remaining on its tires, within a distance of less than 40 feet. Indeed, almost any experienced rider can achieve an aggressive (emergency) deceleration rate of 0.8gs (recall that virtually any rank amateur/beginner can achieve a deceleration rate of 0.6gs) which means a stopping distance of 40 feet. Since this rider left a skid mark of 43.5 feet and was still traveling at about 18 mph at the end of the skid, it is patently obvious that WERE IT NOT FOR INEFFECTIVE/INAPPROPRIATE BRAKE USAGE THERE WOULD NOT HAVE BEEN A COLLISION. In terms of contributed negligence, this rider provided far more than 50% of the causative negligence and had the ability to completely avoided the collision. With proper brake usage she could have stopped at least THIRTY FEET prior to the impact. Who was responsible for this accident? Clearly, the motorcycle rider. He failed to notice the motorcyclist. He relied on the legal skills of 'his' attorney when, in fact, the attorney was provided by his insurance company and was actually representing THEIR interests ahead of the insured. This is an obvious conflict of interest!! Let me spell out that last mistake for you. Suppose that you have an insurance policy that provides you the minimum protection required by the law in your state. For example, say it provides you $50,000 of liability coverage. Then suppose you are involved in a case such as this one and you are sued with a claim of $1,000,000 damages. The insurance company CANNOT lose more than $50,000 and has HIGH incentive to limit their costs to that amount. That is, a payment of $50,000 plus the expenses they pay for in defending your case (attorney cost and the cost of experts, for example). They can minimize their costs by simply settling the case (with your agreement). The plaintiff, however, if they believe that they can win the case based on its facts, will have no incentive to settle the case. Even if the attorneys on both sides agree to a settlement of, say, $500,000, you are stuck with a judgment against you in the amount of $450,000 and the insurance company still pays only $50,000. Why should the insurance company spend more than a minimal amount on your case if the plaintiff is going to settle for, or outright win, a meaningful amount in excess of $50,000? That is NOT a consideration on your behalf - it is a consideration on behalf of the insurance company. A conflict of interest that is obvious. A 'fender bender' gets taken care of by the insurance company assigned lawyer. A major case merits your retaining an attorney to look out for YOUR interests. In this case, because the plaintiff's side could prove with reasonable certainty that she was not speeding and that the car driver did turn left in front of her, it had a terrific case to present to the jury. The car driver's attorney had to prove that the motorcyclist contributed significantly in terms of negligence resulting in the collision, but had NO INCENTIVE TO PAY WHAT IT WOULD COST TO DEVELOP THAT PROOF. It is the job of an expert witness to educate the jury so that they can make an informed decision in the case. If he is a motorcycle safety expert, then you should expect him to tell the jury that it is NEVER, EVER, NOT ONCE IN YOUR LIFETIME appropriate for a motorcyclist to aggressively use his rear brake. Had that message been conveyed properly, the jury would have better understood the case and perhaps allocated a significant percentage of negligence on the part of the motorcyclist which would have saved this defendant a huge amount of money. And if that witness failed to understand the importance of his words, the defense attorney certainly did not, yet failed to help that witness 'clarify' his testimony. The jury was left hearing only the dogmatic MSF words - 'Emergency braking', and the case was lost as a result. The car driver ends up with a judgment against him of several hundred thousand dollars even though HIS NEGLIGENCE WAS INSIGNIFICANT AS COMPARED TO THAT OF THE MOTORCYCLIST.